Three-dimensional images of tissue samples could help spot cancer early, say researchers. 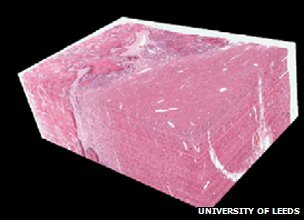 Scientists from the University of Leeds have created a technique to generate hi-resolution, colour 3D images of a piece of tissue. The images can be rotated on a computer screen and examined from any angle. Cancer Research UK said the technology could help researchers understand how cancer grew and spread, and learn how to treat it more effectively. Digital microscopy is not new - tissue scanning first appeared a decade ago, replacing the conventional method of manually cutting ultra-thin slices of tissue one by one to then examine them under a microscope. But these scanners, which are now used around the world, produce two-dimensional images, revealing only one cross-section of that particular piece of tissue. And this has drawbacks, according to Dr Derek Magee, one of the researchers involved in the study. "The tissue is of course three-dimensional, and in a lot of applications this three-dimensional nature is important," he told BBC News. "For example, if you take a blood vessel, which is a branching network of tubes, and you take a slice of it, the 2D image that you get is an ellipse. "This tells you absolutely nothing about the connectivity, or the specific branching, of that particular network of blood vessels, which could be particularly important for cancer specialists." A 3D image could help provide much more information than a simple 2D scan. To create one, a piece of tissue must be cut with an ultra-precise machine called microtome into hundreds of very thin slices. Each slice is then put onto a 1mm-thick piece of glass and loaded into a digital scanner. The scanner then creates 2D impressions of each cross-section, and this is where the new technology comes into play. The software developed by the Leeds University team generates a three-dimensional shape from these virtual slides, creating a realistic image that a researcher can manipulate and spin around. "This may help spot small tumours that could be missed by conventional approaches," said Dr Magee. "Also, if there is a major blood vessel fairly nearby, it will be possible to see if a tumour has reached it. "And if it has not, you can probably cut it out very safely." It is the same with organs, added Dr Magee - if a surgeon wants to remove a tumour near a very sensitive organ, the main question is about the safety of the procedure. This technology could help researchers understand more about the disease, and how to treat it more effectively, said Dr Kat Arney, science information manager at Cancer Research UK. "We're beginning to understand just how complex cancer is," she told the BBC. "A tumour is a complex three-dimensional 'organ' made of cancerous and healthy cells, including blood vessels, immune cells and other 'normal' cells. "It will be fascinating to see how this exciting new technique is taken forward by cancer researchers, and what secrets it can yield about the disease." In the past, there have been attempts to create 3D images of tissue samples. But the images were low resolution and hence not very detailed, generated after taking photos of slides on a microscope with a camera, one by one, and then assembling them digitally. But the Leeds University team said that their approach was the first time a standard digital scanner had been used to produce high-resolution images. 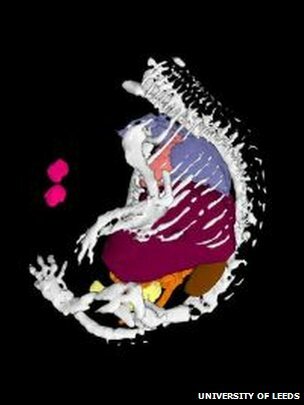 "Up until now, the use of 3D imaging technology to study disease has been limited because of low resolution, and the time and difficulty associated with acquiring large numbers of images with a microscope," said lead researcher Dr Darren Treanor.